Lorrie knits and sews: Popping up for air. The blue socks from last post are now in Illinois, along with the Christmas stocking. The socks were a belated birthday gift. I'm working on vest #3 for the little grandkids. This is the littlest vest. These are Christmas presents. Another pair of socks was finished and delivered in time for a December birthday. Someone's favorite colors are orange and green. I've been busy at work. Not enough work to have hired help come in, but a little too much for me to handle some days. It has to do with what needs doing and what problems crop up. There are a number of projects that need doing before Christmas. 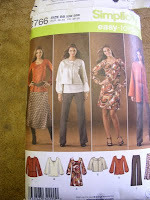 A coat lining is at the top of the list, followed by a needlepoint rug repair, and two denim skirts to make. Things were slow a couple of weeks ago and I was able to make a pair of pants for myself. I've been trying to spend 30 minutes a day sewing for myself or family. Some days it works and some days it doesn't. The pants are nothing special, no pickets, no waistband. Fit is pretty good and I'm working on improving it. I'm tired of wearing pants that don't quite fit. I'm between sizes in RTW and they aren't made for a mature figure anyway. 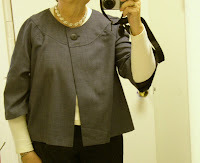 I was also able to make a jacket from the same fabric as the pants. I don't expect to wear them at the same time. 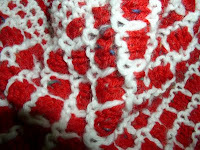 This is the pattern I'm using. Picture taken in a mirror, so everything is reversed. The jacket is unlined. I may line it if I make it again, so it doesn't hang up on the shirt underneath. The neckline is a problem. I either need a turtleneck or a wide neckline under it. The fabric is a poly/wool inherited from my mother-in-law. I fancied it up with top-stitching thread and a bound buttonhole. I have red velveteen left over from the minister robe. If there is enough of it, I'll do a lined version of the jacket. This time, I can buy more fabric if I want to. Old stash doesn't give you that option. It's finally wooly weather here in Cleveland. Temps in the 20's and windy. This fall, my shop varied between chilly when the heat was off and hot when it was on. Outdoor temps in the 50's and 60's. Now that it's cold outside, sweaters are in order. I'm in office space and the building boiler was repaired over the summer. I'm glad it works better, but knowing how to dress is a challenge. I'm looking at more jackets and cardigans for the in between weather. I need a loose jacket to work in for comfort.